Beach Dreams is great for beach lovers and snorkelers. The beach is a few steps away from the pool, with a well-maintained lawn in between. A snorkeling reef is just a short swim away from shore, and you can see all kinds of tropical fish, turtles, and rays swimming in the area. You can build castles in the white sands along the shore, or look for shells and sea glass to take back home. Your family and friends will love vacationing in Beach Dreams, with swimming and snorkeling right in your backyard! Beach Dreams Villa sits steps away from the white sands of Mahoe Beach. With four air-conditioned bedrooms and ocean views, this villa is perfect for couples or families on vacation together. Beach Dreams can sleep up to 11 guests, including children. The stone pool deck and Jacuzzi are surrounded by lounge furniture. 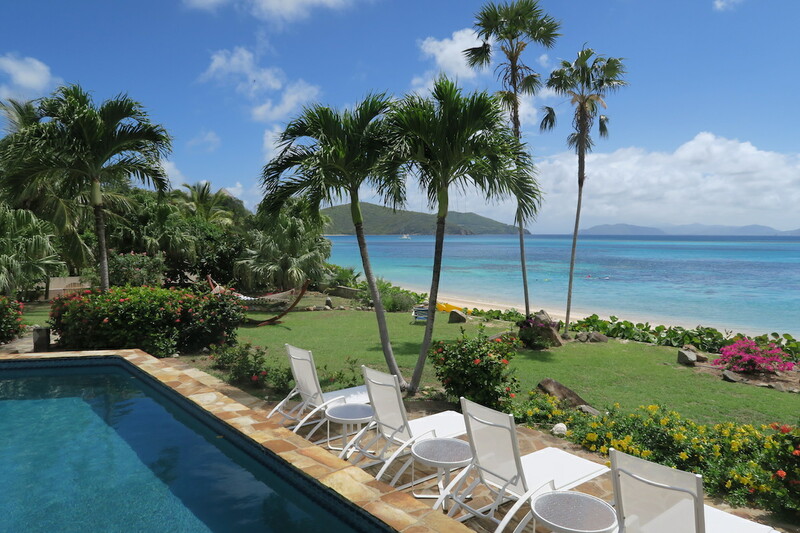 The beach is located on the opposite side of the lawn, renowned for its sugary white sand and nearby snorkeling reef. A wide veranda shades an al fresco dining area, which opens to the living room. Just inside, the living area blends with the dining area and kitchen. Guests can enjoy DVDs on the flatscreen TV as they eat at the dining table. The adjacent kitchen is fully equipped with granite countertops, stainless steel appliances, a breakfast bar, and an espresso machine. Each of the air-conditioned bedrooms has an ensuite bathroom and ocean views. The first two bedrooms have king-sized beds and futons, perfect for couples with children. The master bedroom has a king-sized bed and a single futon, and the second bedroom has a king-sized bed and queen futon. The third bedroom has a king-sized bed, and the fourth bedroom has two twin beds. The sleeping arrangements allow a variety of guests to enjoy Beach Dreams. Beach Dreams has access to a communal tennis court located in the center of the Mahoe Beach community, which is in the middle of Virgin Gorda. Shopping, dining, laundry facilities, and supermarkets are only 5-10 minutes away in Spanish Town. Villa is directly on Mahoe Beach.